When all the kings of the Amorites beyond the Jordan to the west, and all the kings of the Canaanites by the sea, heard that the LORD had dried up the waters of the Jordan for the Israelites until they had crossed over, their hearts melted, and there was no longer any spirit in them, because of the Israelites. 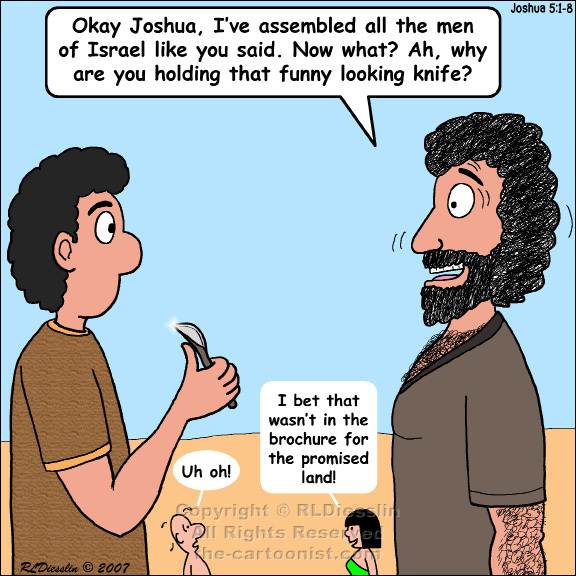 2 At that time the LORD said to Joshua, "Make flint knives and circumcise the Israelites a second time." 3 So Joshua made flint knives, and circumcised the Israelites at Gibeath-haaraloth. 4 This is the reason why Joshua circumcised them: all the males of the people who came out of Egypt, all the warriors, had died during the journey through the wilderness after they had come out of Egypt. 5 Although all the people who came out had been circumcised, yet all the people born on the journey through the wilderness after they had come out of Egypt had not been circumcised. 6 For the Israelites traveled forty years in the wilderness, until all the nation, the warriors who came out of Egypt, perished, not having listened to the voice of the LORD. To them the LORD swore that he would not let them see the land that he had sworn to their ancestors to give us, a land flowing with milk and honey. 7 So it was their children, whom he raised up in their place, that Joshua circumcised; for they were uncircumcised, because they had not been circumcised on the way. 8 When the circumcising of all the nation was done, they remained in their places in the camp until they were healed. Well this is just one of those practices that is hard to fathom the reason of it other than hygiene. Circumcision was widely practiced in the region so it was not unique to the Israelites; however it is definitely observed as part of the covenant between God and Israel (initiated under Abraham), so it holds a place of prominence. There is speculation that the Egyptians may not have circumcised enough of the foreskin and thus a redo was in order; and it's unclear why it was not practiced during the exodus, but it wasn't. A fun fact "Gibeath-haaraloth" means "Foreskins Hill." Hard not to chuckle at that!